Admin Center lets you manage how you authenticate users. You can use Zendesk's own user authentication (the standard sign-in process) or you can remotely authenticate users using single sign-on (SSO) and then seamlessly sign them in to Zendesk. You can also let users sign in using popular business or social authentication services such as Google, Microsoft, Facebook, or Twitter. In Admin Center, an end user is any user receiving customer service. If you enable authentication for end users, they'll need to sign in to submit or track their tickets in Help Center. See Configuring end-user access and sign-in in the Support Help Center. The authentication options for end users apply to Help Center only. To authenticate end users who use the Chat or Web widgets, see Enabling authenticated visitors in the Chat widget or Enabling authenticated visitors in the integrated Web Widget. A staff member in Admin Center is any user providing customer service, not a person receiving it. A staff member is usually an admin, agent, or account owner. A staff member may also be an employee who has been assigned a custom role. 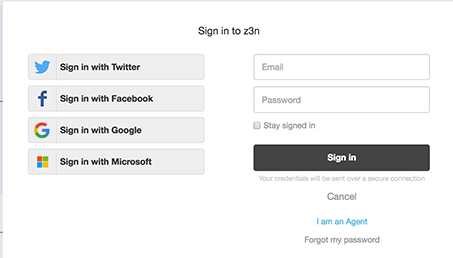 An alternative to Zendesk authentication is single sign-on (SSO). SSO lets users sign in once to gain access to multiple systems and service providers, including Zendesk Chat. To learn more, see SSO (single sign-on) options in Zendesk in the Support Help Center. In Admin Center, click the Security icon ( ) in the left sidebar. Select one of the security options. Note: Security settings for Support, Chat, Guide and Talk are managed in Admin Center. If you are using Chat legacy versions, security settings are managed from the Chat dashboard. Select Settings > Account, then click the Security tab. You can use Zendesk authentication (the standard sign-in process) for staff members and end users. Zendesk authentication is enabled by default. Help Center must be activated. Help Center is the only publicly accessible side of Support and Chat for end users. See Getting started with Guide in the Support Help Center. End users must register. After registering, an end user is prompted to verify their email address and create a password, which the user can then use to sign in. See Requiring your users to register in the Support Help Center. Click the Staff Members or End Users tab. You can set one sign-in option for staff members and a different one for end users. The End Users tab is not available until you activate the Help Center. See Getting started with Guide. Make sure Zendesk Authentication is selected. The option is selected by default. If you're on the Professional and Enterprise plans, set the password security level. See Setting the password security level in the Support Help Center. Users can sign in to Zendesk using their credentials for certain social and business accounts. The social accounts are Facebook and Twitter. The business accounts are Google and Microsoft. End users can use all four – Twitter, Facebook, Google, and Microsoft. Staff members can only use Google or Microsoft. To learn more, see SSO (single sign-on) options in Zendesk in the Support Help Center. In Admin Center, click the Security icon ( ) in the sidebar. Select the social or business SSO option you want to enable. If you want users to use only the SSO option, disable the Zendesk Authentication option. Warning: Disabling Zendesk authentication permanently deletes any Zendesk passwords on record within 24 hours. Secure Assertion Markup Language (SAML) is available only on Professional and Enterprise plans. SAML is supported by many identity provider services, such as Okta, OneLogin, Active Directory, and LDAP. For information on configuring SAML single sign-on, see Enabling SAML single sign-on (Professional and Enterprise). JSON Web Token (JWT) is available on Team, Professional, and Enterprise plans. Credentials and user information is sent in JSON format encrypted using a Zendesk shared secret. For information on configuring JWT single sign-on, see Enabling JWT (JSON Web Token) single sign-on. To learn more, see Enterprise single sign-on in the Support Help Center. You can enable SAML or JWT single sign-on only for staff members, only for end users, or for both groups. Click the Configure link of one of the SSO options and enter the configuration information. After configuring your SSO option, click the Staff members or End users tab and select the External authentication option if not already selected. If you want all users to only use the single sign-on method, deselect the Zendesk authentication option. Any Zendesk passwords will be permanently deleted from the account within 24 hours. Select the Single sign-on option in the External authentication section. For end users, selecting the SSO option deselects the Zendesk Authentication option if enabled. If Zendesk authentication is enabled and you're on the Enterprise plan, you can restrict users from specific IP addresses from accessing your account. For example, to restrict access to users in your company, specify the IP addresses of your company. You can also allow end users to bypass the restrictions. Enabling IP-based access restrictions can break third-party integrations that access your account. Make sure to whitelist all external IPs that access your account through the Zendesk APIs. Some integrations use variable IP addresses that can't be whitelisted. If you want to use these integrations, you must disable IP restrictions. In the IP Restrictions section, select Enabled, then enter the Allowed IP Ranges you want to restrict. If you don't want the IP restrictions to apply to end users, make sure Customers can bypass restrictions is selected. For more information, see Restricting access to Zendesk Support using IP restrictions. If Zendesk authentication is enabled, you can send email notifications to staff members and end users when their passwords change. In the Passwords section, select Password Notifications. If Zendesk authentication is enabled, you can require staff members to use 2-factor authentication when they sign in. Once this setting enabled, all staff members will be required to set up 2-factor authentication the next time they sign in. For instructions for your staff, see Using 2-factor authentication. In the Authentication section, select Require two-factor authentication. For more information, see Managing 2-factor authentication. If Zendesk authentication is enabled, you can set an inactivity time-out period. If a staff member is inactive for the specified period, the staff member is signed out. Staff members remain signed in as long as they actively use the product. Active use includes typing and clicking links. In the Authentication section, select a time-out period under Session expiration.